- There are few hikes that rival the rugged beauty of the 'Classic Franconia Ridge Loop.' Over nine miles of hiking the trail brings out the best of the White Mountain; waterfalls, rocky trails, an enchanting forest, above treeline hiking, an A.M.C. hut built in the alpine zone that is able to survive the harsh weather conditions, and best of all, phenomenal views that will take your breath away. Basically, it's the gateway hike to becoming addicted to hiking! - On Sunday morning, I met up with Erin to hike a clockwise loop up Mount Lafayette and across the ridge over Mount Truman, Lincoln, and Little Haystack. It would be Erin's first White Mountain hike, however, she has quite a bit of hiking experience having hiked out in Colorado, including some 14K's. - We headed up the Old Bridle Path at 8am, and the weather was absolutely perfect. I think I was just as happy to be hiking the loop as Erin, I was so excited for her to be able to do this hike on a great weather day. - The Old Bridle Path wanders its way along Agony Ridge, there are outlooks along the way where Mount Lafayette and Lincoln rise up above to the east and Cannon Mountain and the Kinsman Ridge loom across Franconia Notch to the west. The ridge is called 'Agony' because of the hut crew at Greenleaf Hut. They have to hike in all the food and supplies on old wooden frame packs, weighing anywhere from 40 to 60 pounds as they ascend up the ridge to the hut at about four thousand feet high. - The real gem of the hike starts after reaching Greenleaf Hut where you hook onto the Greenleaf Trail. The trail semi steeply attacks the western cone of Mount Lafayette, breaking out above treeline and following cairns all the way to the top. As you ascend to five thousand feet in elevation the Kinsman Ridge to the west sits several hundred feet below. You can see the ski trails of Cannon Mountain, the Cannon Balls, the Kinsmans, and Lonesome Lake. Also, on this day we had the treat of seeing some stealth campers, basically half naked roaming around the alpine zone to go with the view! - Mount Lafayette's summit is the sixth highest peak on the White Mountain 48 - 4,000 footer list, just over 5,200 feet. It is the northern terminus of the Franconia Ridge Trail, and the southern terminus of the Garfield Ridge Trail. From the summit you can see almost all of the Pemigewasset Wilderness and the surrounding ridges that makes up the boundary of the Pemi and it's 'Loop'. - Erin and I took a nice break on the summit looking south towards Mount Lincoln, taking in the great view of the ridge before setting off toward Mount Lincoln. The trail along the ridge is a mix of rock slab, rock boulders, dirt, and broken mini gravel. It goes up and down over the sub peak of Mount Truman, then up and down over Mount Lincoln, passes through the 'Gargoyles', and then a minor up and down to Little Haystack. All along the ridge the views are endless, today we had some hazy skies but still had views up to sixty miles in all directions. - As we approached Little Haystack the crowds started to pick up. The loop hike is one of the most popular hikes in the Whites, probably only second to Tuckerman Ravine on Mount Washington as far as foot traffic goes. If you want to avoid the crowds up on the ridge on a weekend, start at 8 am or before. - When we hit Little Haystack we descended the Falling Waters Trail. It quickly heads back into the woods and is steep with rugged footing (rocks, roots, mud), then it becomes more gradual over some very long switchbacks until reaching the top of Cloudland Falls. - Over the next mile the trail drops down along cascades and waterfalls, the highest waterfall, Cloudland Falls, is the most majestic and on this day the water was surprisingly flowing at a high volume. After Cloudland Falls is Swiftwater and Stairs Falls, they're not nearly as big but they are equally refreshing to walk by on a hot summer day. - After Stairs Falls the trail crosses Dry Brook (oxymoron) and then gradually makes its way back to the trailhead at Lafayette Place. - Over the nine mile loop, Erin and I took in all the views from the ridge, descended in 'parkour' style from root to rock to dirt (as defined in the show The Office, click here for vid), followed by a nice cooling off along the waterfalls on the way back to the car. - Erin really enjoyed her first hike in the Whites and afterwards we went to another White Mountains staple, the Woodstock Inn Brewery to have a refreshing beer and a yummy meal before heading back south! Stealth campers, luckily when I snapped this they had clothes on! The classic Franconia Ridge shot! We looked like twins, the color coordination was unplanned! Beautiful clouds floating high above the White Mountains all day! Dogs running on Lil' Haystack! He looks sad, but this was a very happy and cool dog! Awesome pictures!!!! I'm planning on doing this hike next week, and this provided AWESOME trail info!!! You are so lucky to have gotten such a wonderfully, beautiful day!!! I hope I have nice weather too!! Thank you, Charlotte! Enjoy the Franconia Ridge, Every time I'm up there I just love the views so much, hope you have a blast! Thanks for sharing this wonderful hike, I really love to try it sometime in October. 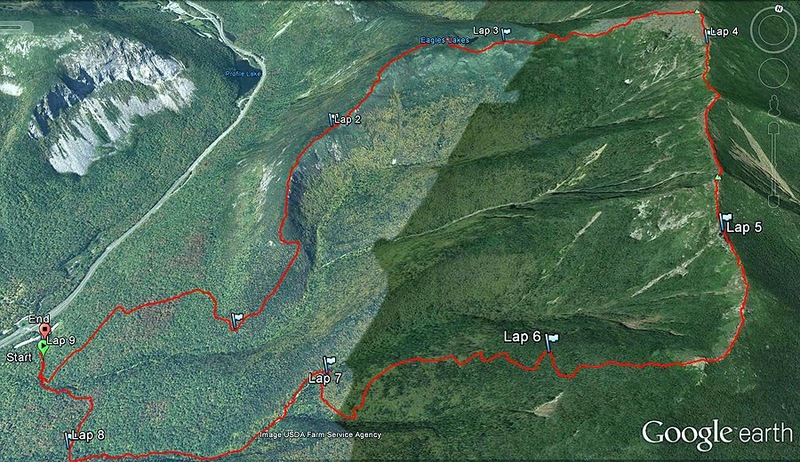 For new hikers, (I have never hiked for more than 2 hours on rough trails), could I handle this hike? Hi Anonymous, glad you liked the report and pictures. Thanks! As for hiking it in October, you definitely can do it. However, before you attempt it make sure you check the weather because in October it can be a great hike with decent temperatures in the low 50 to low 60's OR it can be around freezing with rain and high winds. Thank you so much for your quick response and great tips. I will definitely check weather before I go. If you're going out as a new hiker and in pretty good health and carry the essentials and have paid attention to weather (thunder/lightning = get down ASAP or find a low spot and wait till it's gone on Franconia Ridge) and your turn around time, you'll have a great time. I have done this loop in both directions several times. Unless there has been heavy rainfall the water crossings are pretty easy and you will not get your feet wet. As for which direction to go in, that depends on what you prefer - do you feel more comfortable ascending the steep trail or descending it. The Falling Waters Trail is steeper than Old Bridle Path but it's not treacherous. These trails are rocky and have spots with rough footing but nothing to worry about. This hike gets extremely crowded on the weekend so get their early to beat the crowds. Enjoy your hike!